Candles are lit in memory of those killed in the 2004 school siege in Beslan, in St. Petersburg, Russia, Monday, Sept. 3, 2012. Candles are lit in memory of those killed in the 2004 school siege in Beslan, in St. Petersburg, Russia, Monday, Sept. 3, 2012. More than 330 people, including 186 children, died during the siege and the storming of the school on Sept. 3, 2004 in Beslan, southern Russia. 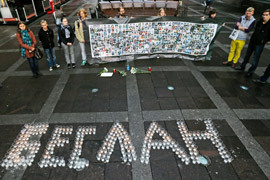 The candles say Beslan. Source: AP Photo / Dmitry Lovetsky.